Bobby Julich does it too. Actually, I think it's his alien third arm. Last edited by fujiacerider; 07-25-16 at 01:23 PM. It's not fred if it's built into the jersey. Or maybe it's more fred. I can't find my rulebook. Also, it's a fairing. Which could make it more or less fred. Dunno. If your nickname is "Fast", and you have the goods to back it up, you are never a Fred, no matter how many camelbaks. But he is a Fred. He will always be a Fred!! Literally, he is a Fred. By definition. I knew Bobby Julich did it, but I thought the UCI outlawed them last year? Some pros like Bobby Julich will sometimes wear a camelback under his skin suit. CSC's Bobby Julich recently signed a deal with hydration system maker Camelbak, putting his use of the company's products on a formal basis. As well as continuing to use the company's RaceVest systemn, Julich will provide R&D testing, giving the company feedback on CamelBak products, and how they can best be developed to fit a road cyclists' needs. Julich, who is getting a bit of a reputation as a free-thinker with his use of devices like Camelbaks and elliptical chainrings, surprised even Camelbak staff when he turned up at last year's Tour de France using a RaceVest in the team time trial. Camelbak's VP of marketing Sky George told bikebiz.co.uk that he "almost fell off my chair" when he saw footage of the time trial. However, Camelbak hasn't yet reintroduced the RaceVest, which allowed riders to carry 40oz of water under their jerseys so as not to obscure all-important sponsor logos. It ceased production in 2001. "It was a great product, but one with a very small market," said George. Julich certainly agrees that hand-free drinking is the way to go for time trials. "Anything that causes you to sit up, out of your most aerodynamic position, could cost you the race," he said. "Being able to simply sip from the hose, situated just under my chin, keeps me in the most efficient position, and not to mention keeps me hydrated." Back-mounted drinking systems are wildly popular with mountain bikers - the tech desk has lost count of how many muddy mini-backpacks he owns - but road cyclists have always seen them as gimmicky. Maybe Julich's advocacy will change things,and we'll see enough demand for Camelbak to reintroduce the RaceVest or come up with an updated version. P.S I do not use a camelback for road cycling, but use them all the time for backpacking. 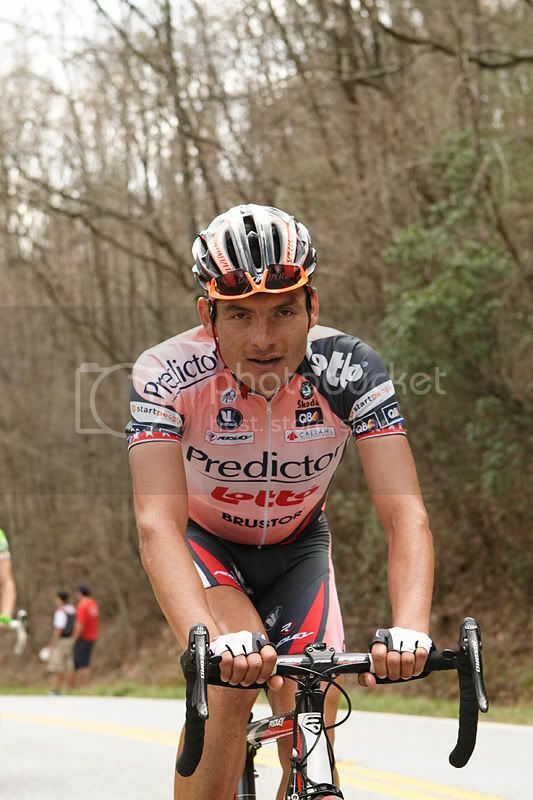 Freddy suffered on the climb up Brasstown.